What would you do for your brother? Would you give up your dreams to protect him and keep him safe? That is the question at the heart of THE SISTERS BROTHERS, the new western from director Jacques Audiard. Joaquin Phoenix and John C. Reilly are Charlie and Eli Sisters. They are notorious assassins, chasing a man through southern Oregon and northern California in the 1850’s. The work for a mysterious man known only as the Commodore. When someone steals from him, he sends the Sisters Brothers are sent to recover whatever it is and kill the thief. They are very good at their job, if a bit extreme. This time they are after a chemist colorfully named Hermann Kermit Warm (Riz Ahmed) who has a formula for extracting gold from rivers. A tracker is also after him (Jake Gyllenhaal), acting as a ghoulish advance man for the Sisters Brothers murderous task. The brothers are both brutal, but in different ways. Charlie is a blunt instrument, killing without much remorse or consideration for conscience or his soul. Eli is more thoughtful. He has thought about getting out and how that happens. He is a sensitive soul who seems to only be in it to protect his brother from the revenge that is surely in their future. Phoenix is great. His slightly crazy eyes play perfectly into Charlie’s personality. As good as he is, Reilly is better. He is tortured and exasperated by some of what Charlie has done. He pines for a woman and is not happy that Charlie makes fun of him for it. As angry as he gets at Charlie, Eli would never abandon him, even though he threatens to. And when Charlie is horribly injured, Eli takes charge of the partnership to care for his brother and end their commitment to the Commodore. The supporting performances from Ahmed and Gyllenhaal are also strong. Every character is more layered than he appears. Ahmed talks about a socialist utopia, while Gyllenhaal writes like a man who has too much education for his job and who is escaping his own demons. While the film takes place in the American west Spain and Romania stand in for Oregon and California. I really didn’t notice much of a difference. The score by Alexandre Desplat is brooding and ominous, perfectly fitting the tone of the film. 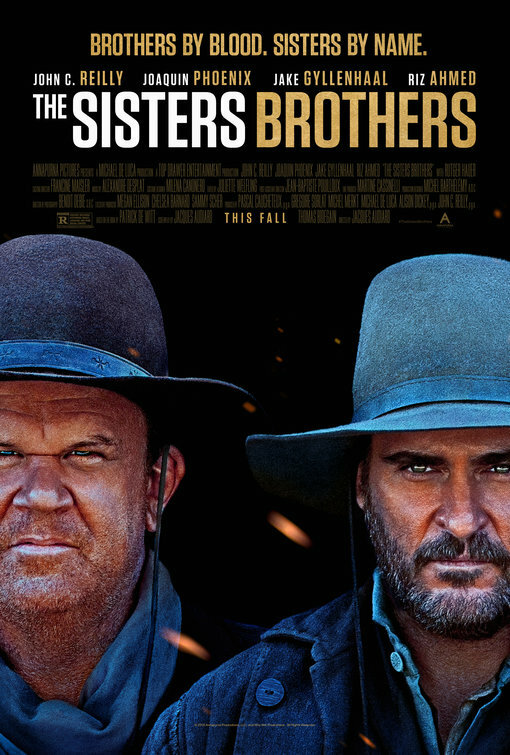 THE SISTERS BROTHERS is a thoughtful meditation on brotherhood, brutality and the society of the 1850’s American Frontier. It’s what a good western can be in the right hands.